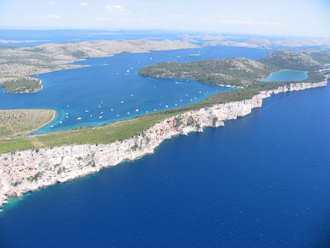 Dugi Otok translates as "Long Island", referring to its long, stringy shape that measures 43km by 4km. Located in northern Dalmatia , (see Dugi Otok on a map) the lack of any fresh water source on the island has left it with a dry, rugged look and a perpetually struggling tourist industry. Although left behind by its more famous sister islands to the south, Dugi Otok island makes a relaxing alternative to more populous destinations. 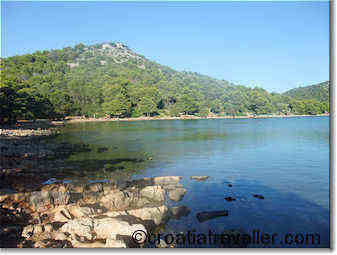 The main highlight of Dugi Otok is the spectacular Telascica Nature Park on the island's southern tip. 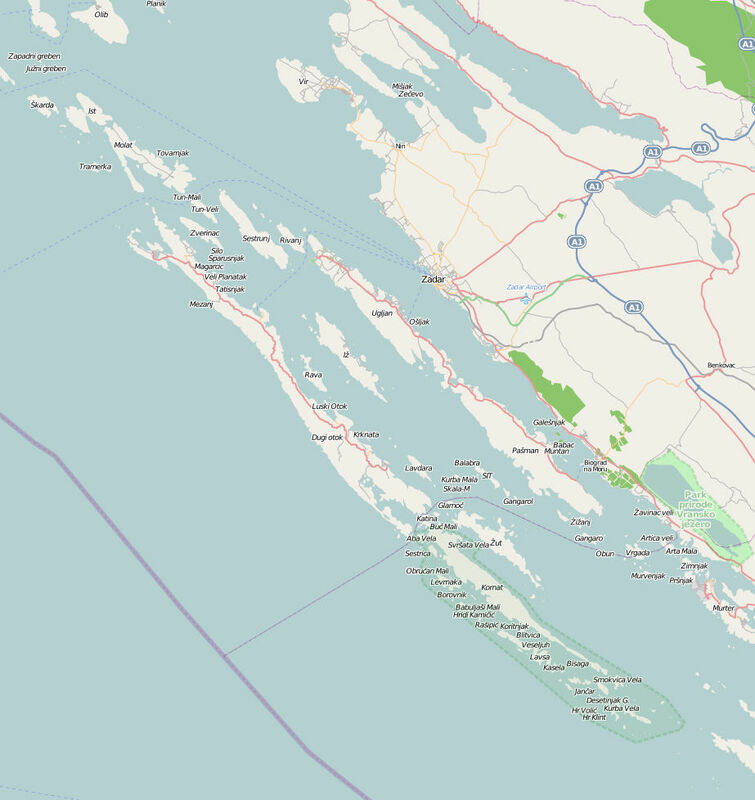 The landward side of Dugi Otok is indented and relatively green with small hamlets spaced throughout. The seaward side is barren and steep with cliffs that climb as high as 100 metres. Most of the villages lie in the more verdant parts of the island, where the land is carpeted with pines, olive and fig trees and macchia. Many villages have their own bays with rocky or pebbly beaches that are rarely crowded. At the far northwestern end is the large and well-protected Soliscica bay with several coastal villages: Veli Rat, near the lighthouse of the same name; Verunic, Soline and Polje are even smaller, numbering only a few dozen houses. Nearby there are several small, sandy beaches sheltered by trees and a larger very beautiful, pine-rimmed pebble beach, Saharun. In a cove on the eastern coast about 2km east of Soline is the village of Bozava, curved around a tranquil harbour and housing a hotel in a nearby pine forest. There's a stone slab beach near the hotel and a sandy cove not too far away. Next are the villages of Dragove, a medieval village perched over a bay and boasting a 12th-century church. Brbinj is in the midst of olive groves and pine trees and overlooks Lucina and Jaz bays. Savor also has a parish church dating from 1670 and on a nearby islet is the church of St Pelegrin dating from the beginning of the 14th century. In the sheltered bay of the village of Luka are other sandy beaches and not far from the village are a few Karstic caves. The village of Zman is on a slope over the bay of the same name and has a parish church dating from the 13th century. Around it, traces of pre-historic life have been found. On a plateau above the bay of Triluka lies Zaglav with a Franciscan monastery and a 15th-century church. 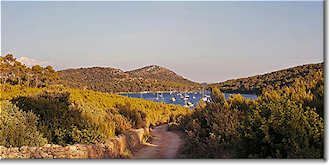 The main town and capital of Dugi Otok is Sali, which makes the best base to explore the island. A scattering of houses fans out from the attractive little port which forms the centre of town. The village was named after the saltworks which date back at least as far as the 12th century. A Gothic church from the 15th century has fragments of carved stone ornamentation, Glagolithic inscriptions and early Renaissance altar paintings. Notice the old townhouses in the village and the ruins of Illyrian fortified settlements in the outskirts. The offshore waters of Dugi Otok are known for scuba diving, especially in the waters surrounding nearby Mezanj Island and the Telascica Bay Nature Park, a spectacular bay dotted with ten islands and islets. Also, you're not far from the teeming coastal waters of the Kornati Islands. Find out more about diving in Croatia. . . Unfortunately Dugi Otok is not the easiest island to visit on a day trip even though daily Jadrolinija ferries run from Zadar to Brbinj, Bozava and Zaglav. The schedules make a day trip impossible most of the year and even an overnight needs to be planned carefully. The only car ferry runs to Brbinj; the other ferries are passenger only. Public transport is minimal on the island. The only sure bus connection runs from Bozava to and from the Brbinj ferry. You need to rent a car to see the island but there's no car rental on the island, only in Zadar. It's easier to rent a scooter or boat from one of the travel agencies. There are only a few hotels on the island but private accommodation is plentiful and reasonably priced. In Sali, there's only the three-star Hotel Sali but in Bozava there's the three-star Hotel Mirta, Hotel Lavanda, Hotel Agava and the four star Hotel Maxim. To really get away from it all, stay in Gogonia Apartments in remote Verunic. You can also stay in a lighthouse on Dugi Otok. The Veli Rat lighthouse has one apartment and is on the southwestern cape of the island. Supposedly, the outside is coated with egg whites to make it more water and wind-resistant! More.